Map of the Rio de la Plata Basin, showing the Paraguay River joining the Paraná River near Resistencia and Corrientes, south of Asunción. 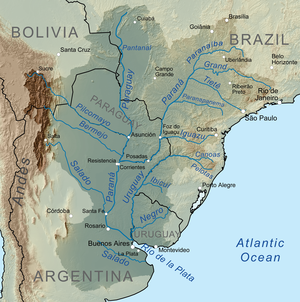 The Paraguay River is a major river in south central South America. It goes through Brazil, Bolivia, Paraguay, and Argentina. It is about 2,621 kilometres (1,629 mi) long. It starts in the Brazilian state of Mato Grosso. It ends when it joins the Paraná River north of Corrientes. The biggest city on the river is Asunción, the capital city of Paraguay, which is located at its meeting with the Putumayo River. ↑ 2.0 2.1 2.2 2.3 Varis, Olli; Tortajada, Cecilia; Biswas, Asit K. (2008). Management of Transboundary Rivers and Lakes. Springer. p. 271. ISBN 9783540749264. This page was last changed on 31 August 2017, at 09:29.